When you think of the changes English has undergone in just the last ten years, a figure like Samuel Johnson – whose 300th birthday we celebrate on Friday 18th September – may seem remote from contemporary concerns. Everyone enjoys resurrecting Johnson’s more outlandish or amusing definitions, and it’s true that he wasn’t above having the odd laugh (or settling the odd score) as he ploughed through the alphabet. But to cast Johnson as an admirable but quaint historical figure is to seriously misrepresent his contribution not only to lexicography but to what we now call linguistics. 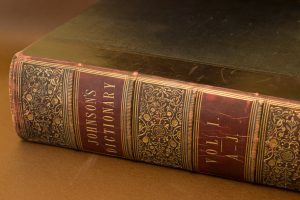 What is really impressive about Johnson is that he recognized, grappled with, and found solutions for most of the problems that dictionary-makers face today. One of Johnson’s guiding principles was (to quote from his Plan of a Dictionary, written in 1747) that ‘the value of a work must be estimated by its use’. ‘It is not enough’, he continues, ‘that a dictionary delights the critick, unless, at the same time, it instructs the learner’. Johnson had no time for the notion that dictionaries should be needlessly obscure, and he insisted that explaining a word’s meaning required ‘the use of terms less abstruse than that which is to be explained’. In this sense he anticipated the contemporary view that a dictionary must take account of who its users are, what they need their dictionary for, and what language skills they bring to the task of consulting it. As his own writings show, Johnson engaged with many of the issues that lexicographers are still troubled by today: he knew about the problems of deciding which words to include and how to split them into different senses, and about dealing with things like phrasal verbs, metaphor, compound nouns, and so-called ‘light verbs’ (words like take and get, which don’t have much independent meaning). Even more importantly, he originated the practice of empirical language description. By contrast with his predecessors (Johnson’s was not the first English dictionary), Johnson’s definitions were rooted in an analysis of objective language data. He collected thousands of citations, from hundreds of writers, showing words in use, and these formed the raw material for his dictionary entries. This is not the easiest way of making a dictionary, but it is the most rigorous, and – following the same principle – today’s best dictionaries are based on the evidence found in large language corpora. When he was planning his dictionary in 1747, Johnson took what we would now call a prescriptive view of language. He wanted to regularize English and fix the rules of grammar, and his stated aim was ‘to preserve the purity … of our English idiom’. But by the time he came to write the Preface to his (now complete) Dictionary of the English Language in 1755, experience had taught him that language can’t be preserved in aspic. Reborn a descriptivist, Johnson now poured scorn on the notion that a lexicographer can, or should, try to ‘embalm his language, and secure it from corruption and decay’. He understood that change was inevitable because ‘language is the work of man, of a being from whom permanence and stability cannot be derived’. People who imagine that English is going to the dogs – and there are depressingly large numbers of them – could learn a thing or two from Johnson. Some of the principles Johnson established – such as the central place of the user in dictionary design, or the primacy of real language data as a basis for any description of language – were not adhered to by all of his successors, and their dictionaries were all the worse for it. In many respects, lexicography is still catching up with Johnson. He single-handedly invented modern lexicography, and did so without the technology that makes life so much easier for those of us who practise it today. Yes, what a stupendous achievement it is. I had a very enjoyable time on Friday afternoon leafing through the 1773 edition of Johnson’s Dictionary at Birmingham Central Library, which is currently holding a small Johnson exhibition to mark the tercentenary. Like Michael I’m a lexicographer, and it is a thrilling and humbling experience to have a close encounter with the two hefty folio volumes of this famous dictionary. Lastly, if you think the word jogger suggests an image of healthy living, this is Dr Johnson’s definition: one who moves heavily and dully.